April 2011 - Contemporary Controls Ltd participated as a silver sponsor in the Niagara Forum Europe 2011 conference held at Wokefield Park, Reading, UK. The venue consisted of an 18th century country house surrounded by a golf course. The estate has been converted to a conference center but we had an opportunity to experience the Mansion House during the conference banquet. Along with a two-day conference there was an exhibit located on "the street" of the conference center. Contemporary Controls had a table showing the many ways the company products could operate in either a Niagara Framework or Sedona Framework environment. For a table-top display, our demonstration was quite busy with a JACE executing a Niagara wire sheet communicating over Ethernet to our BASremote executing a Sedona wire sheet. The BASremote was busy integrating up to BACnet/IP a Northern Design energy meter, a SyxthSense thermostat, Renu I/O block, and a Belimo Modbus to an MP-Bus adapter all over Modbus RTU. Commands from the JACE stroked the Belimo actuators via the MP-Bus. Some point I/O such as a thermistor and a 4-20 mA temperature transmitter were attached to the BASremote. Upon an alarm condition in our Sedona Wiresheet, the BASremote sent an email alert to our mobile phones via our EICR cellular router. Other products on display included our BASrouter connected to an Alerton unitary controller over the MS/TP network, and our CTRLink series of Ethernet switches. One novel demonstration was the powering of the JACE and its companion I/O module over PoE. First an EIPE power injector applied 48VDC power down the Ethernet cable to a companion EIPE functioning as a PoE splitter. The 15 VDC output of the splitter was derived from the 48VDC PoE voltage and used to power the JACE and its I/O module. For loads under 10 watts, this implementation is possible. As for the conference, we heard a lot about Sedona and Tridium's commitment to Sedona Framework. 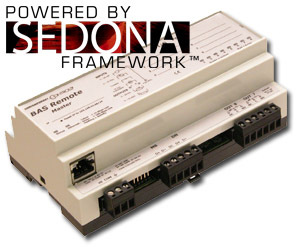 With Sedona Framework release 1.1, we will gain peer-to-peer communication over EIA-485 using BACnet's link layer MS/TP protocol. This will certainly be in our plans for future Sedona products. To learn more, visit the Sedona technology page.